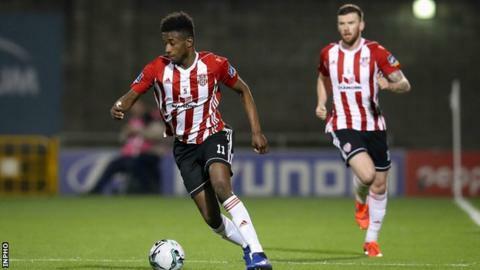 Derry City began the defence of the EA Sports Cup with a comfortable 3-0 win over Longford Town at the Brandywell. In control throughout the contest, Derry hit the front on 18 minutes when Junior Ogedi-Uzokwe headed in his first goal for the club. Eoghan Stokes doubled the lead before Gerardo Bruna rounded off the scoring shortly after the hour mark. The Candystripes ended a six year trophy drought by beating Cobh Ramblers to lift the trophy in September. With a congested fixture list ahead, Derry boss Declan Devine made several changes from the side that defeated Sligo Rovers last Friday. Jamie McDonagh was one of those to return to the starting line-up having missed the last four games through suspension and it was the Northern Ireland Under-21 who delivered the cross for loanee Ogedi-Uzokwe to nod home. First Division side Longford responded brightly to going behind but rarely troubled goalkeeper Nathan Gartside and soon found themselves two down through Stokes' long range drive. Stokes was once again afforded too much space in the second half and when his speculative effort was spilled by Jack Menton, Bruna was on hand to turn in the rebound and register his goal since arriving at the Brandywell alongside Stokes in February. The Candystripes return to league duty against Finn Harps on Friday having made a positive start in Devine's second tenure at the helm of the side.